When I decided to first try my hand at time-lapse photography a little over a year ago, I knew there was one area that I wanted to focus on: the White Mountain National Forest. Starting out, I had no idea how much work even a shorter film like this would be, but it ended up being one of the most rewarding projects I’ve worked on. It’s been a blessing getting such a huge response online after sharing the film, and one of the most common questions has been about the process of creating a time lapse like this. So, here’s a look into the making of my film, plus some tips on shooting your own time-lapse videos in the White Mountain National Forest. While you can create a time lapse by simply speeding up the video, by rendering hundreds of still photos together, you end up with a higher-quality final clip. I like to render my time-lapse at 30 frames per second (some people prefer 24fps), so for every 10 seconds of video, I shoot 300 photos. 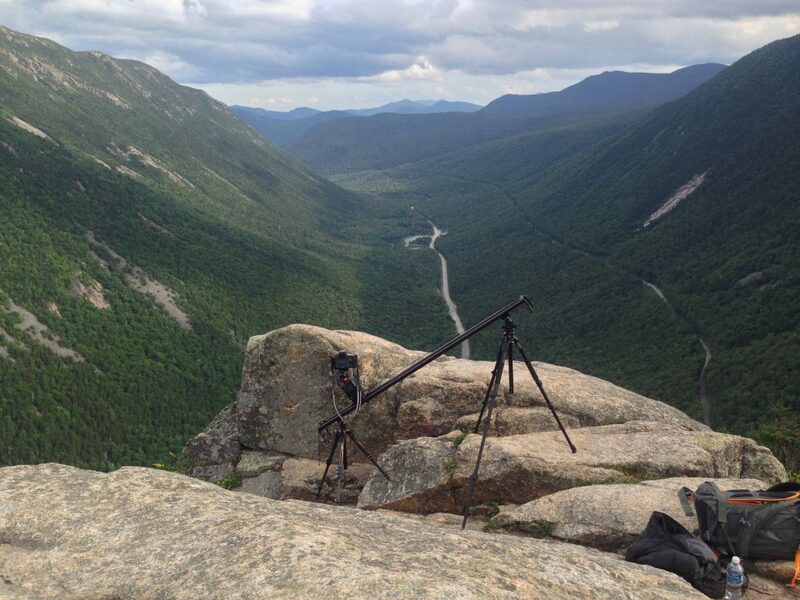 To do this, I use a motorized camera slider to add motion to the time-lapse clips. The slider works by moving incrementally between each of the 300 photos, which creates a smooth sense of motion when the video is rendered. While using motion-control systems like this aren’t necessary, it certainly adds a beautiful, cinematic look. It’s not so fun to carry up a mountain, though! For camera gear, I used the Nikon D750 and mostly the Tamron 15-30mm lens. I also used the Nikon 24-120, 50, and 70-200mm lenses for a few sequences. I get many questions about my gear, but honestly, you can get great time lapses with even fairly basic camera equipment, like a GoPro! Camera capable of manual shooting: Using any automatic modes will result in uneven exposures over the course of your time lapse. Tripod: Because you’ll be shooting hundreds of photos to render into your final time lapse, your camera needs to remain perfectly still. Intervalometer: Some Nikon cameras have a built-in intervalometer, like the D750 I use, but if yours doesn’t have this option, you’ll need to buy one to trigger your camera. You can find cheaper models that will work just fine. Just make sure that you’re buying an intervalometer and not a regular shutter release. 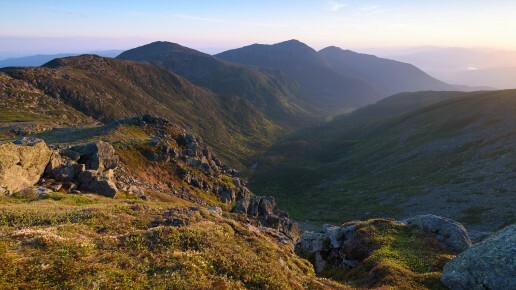 I won’t be going over the safety concerns and planning involved for these shoots, but remember to be prepared for trips to the White Mountains, especially when hiking. Always carry a map, headlamp, and other outdoor basics, so that you’ll make it home to share your new amazing time-lapse clips! When shooting your photos, make sure that your camera is recording these images in Raw and not Jpeg format. By shooting in Raw, you’ll have the editing flexibility needed later when rendering your time lapse. This is absolutely mandatory. Shooting in modes like Aperture or Shutter Priority will result in your exposures varying too much between each photo. You also want to make sure autofocus is turned off; otherwise, you risk having your camera try to focus between each photo. Trust me, there’s nothing worse than thinking you just shot an amazing sunrise time lapse, only to find that, halfway through, your camera decided to focus on a twig in the foreground. I will typically autofocus on my main subject, and then turn it off before starting to shoot. Clear, blue sky days are typically not very interesting or engaging to photograph. Clouds in the sky will give your time lapse nice movement and show the passage of time. I love partly cloudy conditions, as they give greater odds of a colorful sunset or sunrise. For this sunset time lapse from the summit of Caribou Mountain, I used a longer interval of five seconds, because the clouds were moving slow. This is a term that basically means using longer shutter speeds. Using too fast of a shutter speed can make your final time lapse look jumpy. By shooting longer exposures, your time lapse will be smoother. The ideal shutter speed will change, depending on subject, but I aim to shoot below 1/30 in. and 1 in. or longer if possible. This is especially important if you have people moving around in your scene, like this clip from the Flume Gorge. By dragging your shutter and having some motion blur the people moving around your scene, their movement will look smooth when rendered in the final video. You may need filters to limit the amount of light entering your lens, allowing for longer shutter speeds—another reason bright, midday sun doesn’t work well. I always keep a few neutral-density filters of varying strengths in my bag for this reason. Before actually starting your time lapse, take a few test exposures to check your settings. You want to be sure that you aren’t over- or underexposing your scene, and that you maintain detail in your highlights and shadows. This is the time between your exposures, and will influence the feel of your final time lapse. Look at your scene: What are you trying to capture? If there are fast-moving clouds or people, you’ll want to use a shorter interval of one to three seconds; otherwise, the time lapse will look jumpy. If the clouds in your scene are moving slower, a longer interval of five to 10 seconds will show more movement. One thing I like to do is shoot four to five photos at whatever interval I decide on, then look at how much movement is between frames on my camera’s screen, and adjust my interval from there if necessary. By using a shutter speed of 1.3 seconds with a short interval for this sequence at the Flume Gorge, I get a nice motion blur for the people walking the boardwalk. A common mistake when first learning to shoot time lapse is trying to include too many moving parts, which ends up looking chaotic. For example, this could include trying to shoot a scene with fast-moving people, crazy clouds, and trees shaking in the wind. When you share your time lapse, there ends up being too much going on in your frame, and it ultimately looks unappealing. By simplifying your composition, you give your viewer a definitive subject to focus on. Once you start shooting the photos, leave your camera alone. It’s tempting to try and review your images and check settings, but any time you touch your camera, you risk introducing shaking and unwanted movement. Instead, take the opportunity to take a step back and appreciate the scenery, while your camera does its thing. This program is essential for creating my time-lapse film. A free basic version, which works fine for creating clips to share online, allows you to render up to 400 frames (that’s 12 seconds of video) and to export at 1080p. LRTimelapse works alongside Lightroom, evening out any small changes in exposure and creating a smooth final video clip. Now, with these tips in mind, charge up those camera batteries, find some fun locations, and start capturing your own time-lapse sequences!